Scientists say they have made a significant leap towards mass-producing red blood cells suitable for donation. Red blood cells can already be made in the lab, but the problem is scale. A team at the University of Bristol and NHS Blood and Transplant have developed a method to produce an unlimited supply. The artificial blood will be far more expensive than conventional donation. So it is likely to be used for people with very rare blood types. The old technique involved taking a type of stem cell that manufactures red blood cells in the body and coaxing it to do so in the lab. However, each cell eventually burns out and produces no more than 50,000 red blood cells. The trick developed by the Bristol team was to trap the stem cells at an early stage where they grow in number indefinitely. It is known as making them immortal. Once the researchers have this group of cells, they can just trigger them to become red blood cells. Dr Jan Frayne, one of the researchers, said: "We have demonstrated a feasible way to sustainably manufacture red cells for clinical use. "We've grown litres of it." The researchers now have the biological resource to mass produce red blood cells, but they still need the manufacturing technology for mass production. It is like the difference between home-brewing beer and a large brewery. A bag of blood contains about a trillion red blood cells. Prof David Anstee, another of the researchers, told the BBC: "There is a bioengineering challenge. "To produce that much at scale is quite a challenge, and really the next phase of our work is to look at methods of expanding the yield." The cost will be a massive barrier to wide-scale use of manufactured blood. 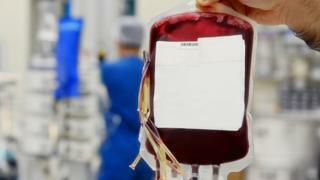 NHS Blood and Transplant says it has no plans "in any way at all" to move away from traditionally donated blood. However, it can be almost impossible to match some people's blood - often from minority ethnicities - with a donor. Prof Anstee added: "The first therapeutic use of a cultured red cell product is likely to be for patients with rare blood groups, because suitable conventional red blood cell donations can be difficult to source." Safety trials of lab-made blood are already planned for later this year.